The oral polio vaccine was banned from use in the United States in 2000. The reason for this ban was because too many children were developing vaccine associated paralytic polio (VAPP) as a serious side effect of the oral vaccine. In other words, they were developing paralytic symptoms that the vaccine was supposed to prevent them from developing, should they have gotten a natural polio infection and developed temporary or permanent paralysis, which are rare side effects of the polio illness anyway. Despite its many advantages, OPV carries the risk of vaccine-associated paralytic poliomyelitis (VAPP) particularly among infants who receive the vaccine for the first time and their contacts. In addition, when polio vaccine coverage is low in the population, this live attenuated vaccine may revert its virulence and transmissibility and pose additional risk for emergence of vaccine-derived polioviruses (VDPVs), which have been associated with outbreaks. Because of these risks, OPV use will be discontinued worldwide once the goal of eradicating all wild poliovirus (WPV transmission) is achieved. Sadly, the result of their decisions has been catastrophic. Polio is spread from person to person by coming into contact with infected feces. It is a known fact that in many parts of the developing world, sanitation is poor and water supplies are often contaminated with bacteria and raw sewerage, therefore, the spread of the disease is inevitable. In August 2015, a team of scientists from the UK, led by Dr. Glynis Dunn, published a paper titled Twenty-Eight Years of Poliovirus Replication in an Immunodeficient Individual: Impact on the Global Polio Eradication Initiative. Their paper exposed the devastating effect that the WHO’s decision is having on the developing world. Poliovirus strains in the oral vaccine are known to quickly revert to neurovirulent phenotype following replication in humans after immunisation. These strains can transmit from person to person leading to poliomyelitis outbreaks and can replicate for long periods of time in immunodeficient individuals leading to paralysis or chronic infection, with currently no effective treatment to stop excretion from these patients. Dunn and her team continued by describing the case of one individual who has been excreting the poliomyelitis virus ever since receiving the OPV vaccine in 1986, a total of twenty-eight years. 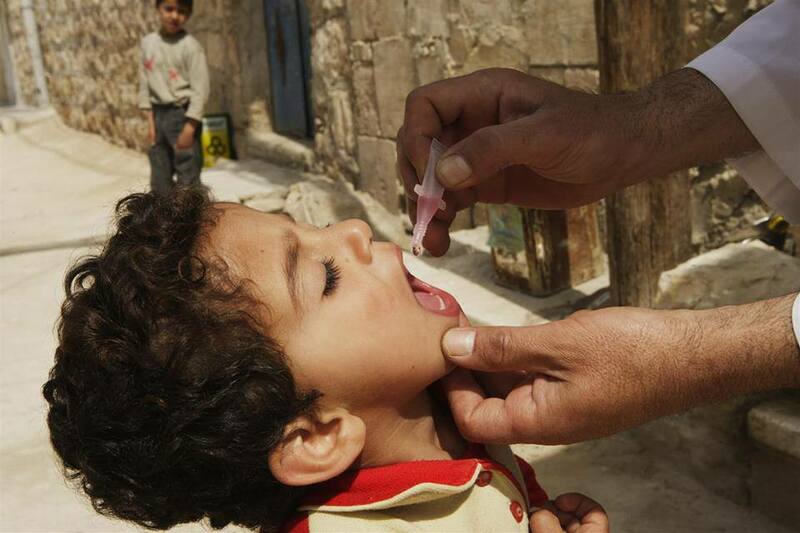 Four of the six WHO regions have been certified polio-free and a country such as India, where massive poliomyelitis outbreaks were very common, interrupted circulation of endemic wild poliovirus in 2010. There has been no case of poliomyelitis caused by circulating wild type 2 poliovirus since 1999, no case of type 3 since November 2012 and the last case of type 1 in Africa was in August 2014, leaving some areas of Pakistan and Afghanistan as the main remaining reservoirs. All type 2 poliomyelitis cases since 1999, except an isolated incident of 10 cases linked to a wild laboratory reference strain in India, are due to vaccine-related poliovirus strains in either recipients, their immediate contacts or after the vaccine virus has regained the ability to transmit and circulate freely. The team believed that the continuing cases of polio that are being spread from VDPVs could be eradicated if the WHO was using the inactivated polio vaccines as opposed to live polio vaccines. Of the total of 73 iVDPV (immunodeficiency-related vaccine-derived poliovirus) cases that have been described between 1962 and 2014, only seven of them involved infections lasting more than five years. The case described here represents the only individual of those seven known to be excreting at present. However, several highly drifted VDPV strains have recently been isolated from sewage samples in Slovakia, Finland, Estonia and Israel. They included examples of all three poliovirus serotypes, although type2 VDPVs were the most prevalent among them. These VDPV isolates showed molecular properties typical of iVDPVs described above indicating that an unknown number of these chronic excreters exist elsewhere. Their paper is extremely worrying and raises the question as to whether or not the continuing polio outbreaks being described in mainstream media are caused not by the polio virus but by contaminated feces. The charade about polio eradication and the great savings it will bring has persisted to date. 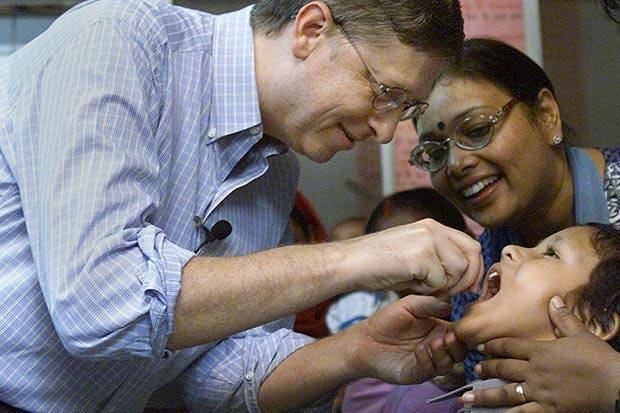 It is a paradox, that while the director general of WHO, Margret Chan, and Bill Gates are trying to muster support for polio eradication, it has been known to the scientific community, for over 10 years, that eradication of polio is impossible. This is because in 2002 scientists had synthesised a chemical called poliovirus in a test-tube with the empirical formula C332, 652H492, 388N98, 245O131, 196P7, 501S2, 340. It has been demonstrated that by positioning the atoms in sequence, a particle can emerge with all the properties required for its proliferation and survival in nature. Wimmer writes that the test-tube synthesis of poliovirus has wiped out any possibility of eradicating poliovirus in the future. Poliovirus cannot be declared extinct because the sequence of its genome is known and modern biotechnology allows it to be resurrected at any time in vitro. Man can thus never let down his guard against poliovirus. Indeed the 18-year-old global eradication campaign for polioviruses will have to be continued in some format forever. The long promised “infinite” monetary benefits from ceasing to vaccinate against poliovirus will never be achieved. The attraction that ‘eradication’ has for policy makers will vanish once this truth is widely known. The fact that we are being lied to is even more disturbing when you consider their data identifies that the children who contract NPAFP are twice as likely to die of their debilitating illness as from the wild polio virus. Sathyamala examined data from the following year and showed that children who were identified with non-polio AFP were at more than twice the risk of dying than those with wild polio infection. … Though all the data was collected within an excellent surveillance system, the increase was not investigated openly. Another question ethicists will ask, is why champions of the programme continued to exhort poor countries to spend scarce resources on a programme they should have known, in 2002, was never going to succeed. Many professionals believe that Neetu Vashisht and Jacob Puliye are correct and blame the oral polio vaccine for cases of NPAFP. Other professionals, however, believe that polio has simply been renamed acute flaccid paralysis (AFP) to give the illusion that the disease has been eradicated. Mr. Ron Law, a risk and policy adviser, believes that since India’s last official case of polio, there have been over 170,000 cases of AFP, which he says, prior to the vaccination campaign, were included in the polio diagnosis. In 1995 India was claimed to have 30,000 cases of paralytic polio in children every year. 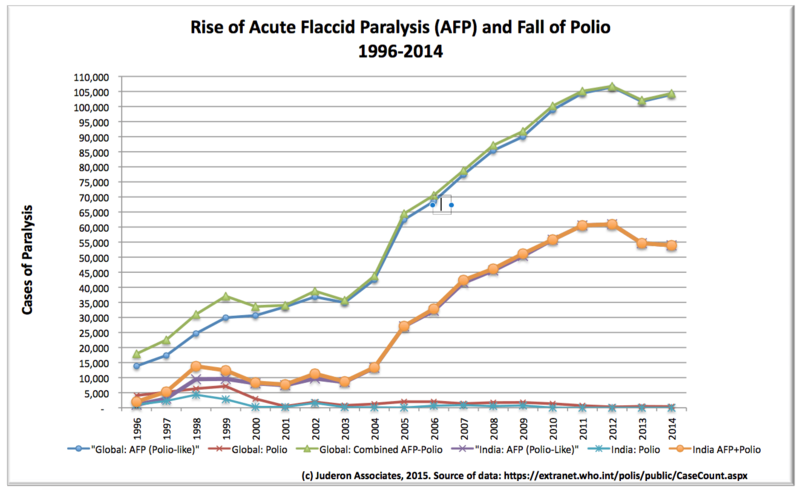 A polio eradication programme was instigated with previous cases diagnosed as polio renamed Acute Flaccid Paralysis, or polio-like paralysis, with cases being screened for polio infection and only polio positive cases being called polio… the other clinically identical paralysis cases were classified as AFP. The good professor implies that polio is no longer rampant. Given that the WHO has recently announced to all and sundry that India is now officially polio free, let’s look at the WHO’s own data, from their website. No doubt Professor Colquhoun is celebrating the wonderful success of the polio vaccination programme in India where children still got polio until recently even after having 30 plus polio vaccinations. I wonder if redefining what was called polio before the vaccination eradication programme to AFP, or polio-like paralysis is what the good professor would call a medical success? I suspect the parents of the 60,848 mostly vaccinated children (up to 30+ polio vaccine doses) paralysed by a polio-like illness will be rejoicing that polio is no longer rampant… that’s 252,000 children diagnosed with polio-like paralysis in the past five years. And the good professor rests his case that polio is no longer rampant while reclassified polio-like paralysis continues unabated. Perhaps the good professor could explain how reclassifying a disease and then claiming eradication of the disease is a medical success? Is that what he means when he said that medicine has moved on? Mr. Law’s graph at the end of his response certainly added weight to his theory. To update Health Impact News further, Mr. Law supplied a second graph using current WHO statistics. Whether or not Mr. Law is correct remains a mystery. However, one thing is for certain: someone, somewhere, is lying. The question is: what are they covering up and why? With the lack of ethics and extortion of the poor continuing to corrupt the vaccine programs, can there ever be an end to the polio epidemic? We must ask ourselves whether or not government lies will continue to mask the facts. If the polio virus can be contracted through contaminated feces and poor sanitation, then you would expect sanitation and providing clean water to be the number one priority of governments and aid organizations. It has been proven over and over again that vaccinations alone cannot eradicate polio. Isn’t it about time that governments stopped their lies and got their priorities right for the sake of innocent children?